Start Your Childcare Business Today! Earn over $50,000 a year!- In-home child care providers that care for eight children full-time can make over $50,000 a year. You can really earn a living in this business. $500 Start-up Bonus- After you complete the registration process with the Iowa Department of Human Services, Building Families will write you a check for $500 to reimburse you for all of your start up costs. Ongoing cash bonuses- In-home child care providers with as little as 12 hours of college credit are eligible for cash bonuses from Building Families every six months. 90% Tuition Assistance- In-home child care providers only have to pay for 10% of their college tuition when they study Early Childhood or Elementary Education. You could get a bachelor’s degree and a teaching license for pennies on the dollar while you work at home. One-on-one consulting- Does all this seem a little imposing? Don’t sweat it! The consultants from our partners at Child Care Resource and Referral will come to your house and walk you through the process to get started. Once you have your business running they will still be there to provide free one-on-one consulting year after year to help you succeed. Write off all of your expenses- When you operate a business in your home, you are eligible for a number of tax benefits that regular workers and homeowners can’t access. That means more money in your pocket! Be your own boss- Your child care business is yours! There is no boss telling you what to do and how to do it. Even better, all of the rewards for your hard work come to you, not some rich guy you don’t even know. Raise your own kids- If you are tired of paying other people to spend time with your kids (or your grandkids), then stop it and start your own child care business. With your child care business, you will finally be able to afford to stay home and raise your own kids because you can make money caring for other little ones while you do it. Work from home- No commute, no dress code, no icy roads to battle on the way to work. Just put on a comfy outfit and you are ready for the day. 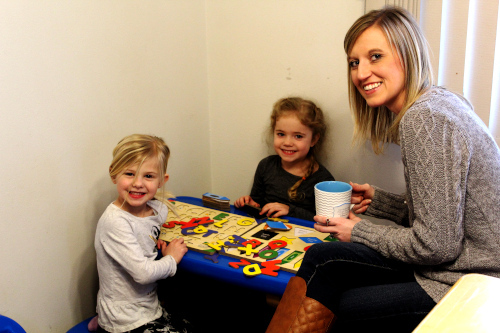 No College=No Problem- You don't need any college to start your in-home child care business. All of the required training can be completed in about a week and we will reimburse you for whatever isn't free. Learn More- Give us a call at 1-515-602-6371 ext. 1 or send an email to mbailey@co.wright.ia.us. If you are thinking about starting a childcare business in your home, you are in the right place! Building Families and its partners can provide you with free financial and technical assistance to succeed. Best of all there is no catch; all of our support is 100% FREE OF CHARGE. Check out the list of amazing benefits open to in-home child care providers. If you would like to learn more give us a call at 1-515-602-6371 ext. 1 or send an email to mbailey@co.wright.ia.us. Learn more about being your own boss from Emily. Hear more about making a good living while you stay at home with your kids.